Although there was some young talent entering the season, the Bucks were still widely considered to be one of the worst in the league after posting a 15-67 record the year before. But just seventeen games in and they already reached ten wins. Thirty games in and they already matched their win total from all of last season with a 15-15 record. Then in late February this team stood at 31-23 and it was pretty obvious they weren’t going to just go away and not make the playoffs yet again. And while they finished just 10-18 with a 41-41 record, it’s what they did in the playoff series against the Chicago Bulls that has a lot of basketball fans curious to see the growth next season. They were down 3-0 in the series and did lose game six by a ridiculous 54 points but they did compete really hard in the first five games of the playoffs and weren’t afraid of the Bulls at all which is something you love to see from a young basketball team. You love to see fight. Michael Carter-Williams is an extremely key component to the growth of this team over the next few years. He’s definitely had some nice moments in his NBA career, but he’s also had some very questionable games as well. So much so, that even after a promising rookie season that led to winning the Rookie of the Year award, a poll of NBA front office personnel did not have MCW in the top-30 point guards in the entire league. A large reason for that is his incredibly poor efficiency, both in shooting and taking care of the basketball. But having Jason Kidd as your head coach and leader should be enormous for his development. He also had a couple of impressive games in the first round against Chicago. Particularly game five where he posted a 22-8-9 line with a steal, three blocks and shot 10-of-15 from the field. Carter-Williams shot 39% in his first 136 career games with Philadelphia, and in the 25 career games with Milwaukee (not including playoffs), he’s already just under 43% shooting. Along with MCW, the other key piece going forward is Giannis Antentokounmpo. “The Greek Freak” has all the talent in the world, but as everyone knew, he was incredibly raw coming into the NBA. And even though he’s shown some great flashes, like in game three against Chicago, he still received a DNP-CD as recently as April 8 against Cleveland. Jason Kidd’s ability to teach this young team and help them grow is as important as any free agent signing they could make the next few years to add to this core. But the first big free agent for this team comes in the way of Khris Middleton. One of their own. Middelton finished the year very strong. Over his final 21 games, Middleton averaged 16.9 points, 46% field goals, 39.4% 3-point field goals, 3.0 assists, 1.5 steals in 35.9 minutes. His performance against the Bulls in the playoffs was even more impressive, especially considering the type of defense he had to face. Middleton scored at least 18 points in four of the six games, averaged 2.8 steals and played 41.2 minutes. But now he’s a restricted free agent and he said he wants to be back in Milwaukee, but I would be very weary of the price tag Middleton will require. Assuming Jabari Parker comes back healthy, where would Middleton play? No team is going to pay someone like him 40-50 million bucks, maybe even more, to come off the bench. 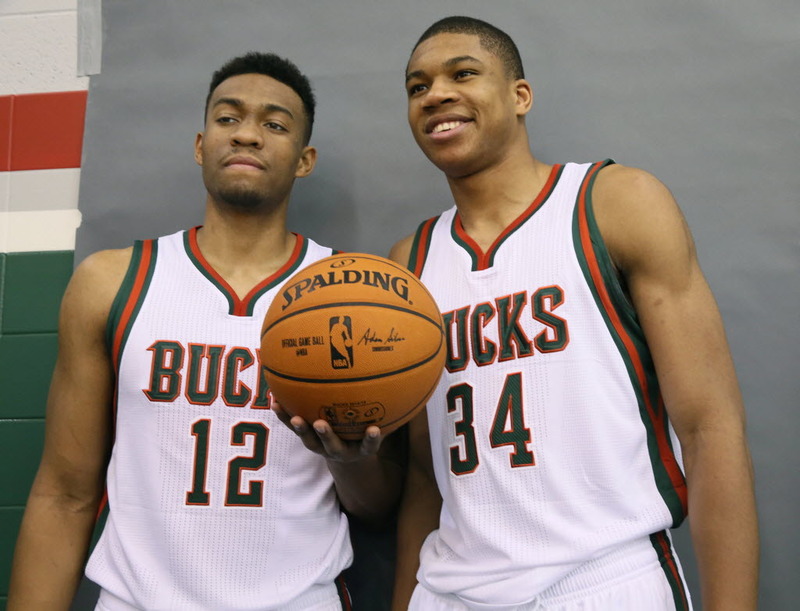 Do you make Giannis come off the bench and possibly even stunt his growth a little bit? There could definitely be some moments where Kidd can move Parker to the four with Giannis and Middleton the small forward and shooting guard. But you’re not going to put that much physical pressure on Parker defensively for more than a few minute stretch here and there. Outside of Middleton, everyone else on the roster is expected to return barring a blockbuster trade of some sort. And that’s key for this team as they continue to build. The one piece I would like to see them attempt to acquire is at the center position. Zaza Pachulia played pretty well but he’s obviously not the longterm answer in the middle. John Henson could certainly see some more minutes at center, but this team could really use an Al Horford-type of big man. Obviously they won’t get Horford specifically, but finding someone with that skill set could go a long way for this team and really enforce the ball movement type offense Kidd can continue to run. Bobby Portis is someone to target for Milwaukee in the draft with those type of all-around offensive skills. The Bucks are one of the few teams that you’d prefer not to make drastic moves for the simple fact of wanting to see how much this group can grow. Just to see the improvement in one season without what was supposed to be their best offensive player is extremely promising. How much better could they get next season? Is 50 wins a possibility?